Manufacturer Part No. : C4900A, HP940, HP-940, HP 940. Colour: Black and Yellow Printhead. Product Type: Printhead. HP Cashback. HP Toner Cashback. They will require a signature. Compatible Ink, Toner & Labels. Suitable printer model: for HP 6100 6600 6700 7110 7610 7612. CISS model: for HP 932 933. Easy to install, simply use. It can use repeatly, it will save your cost greatly. Used on Photosmart Premium Printer : Photosmart B8550 Photo Printer (CB981A). · Photosmart C6380 All-in-One Printer (CD028A). · Photosmart D5460 Printer (Q8421A). · Photosmart D7560 Printer (Q8441A). · photosmart Premium Fax All-in-One Printer - C309a (CC335A). Compatible with HP Designjet T1700 and HP Designjet T1700dr. Genuine HP printhead. During that process you will be issued with an RMA number. Q6651-60039 Color sensor For HP Z2100 Z3100 Z3200 Z5200 Z6100 Z6200 T7100 Z5400. Dispatched with Royal Mail 2nd Class. C9380A Printhead Grey Photo Black. Printhead Grey Photo Black. Printer: Suitable for HP T120 T520. Genuine HP printhead. Colour: Light Magenta, Light Cyan. Product Details. HP 744 Printhead Photo Black and Cyan F9J86A. Original HP Printhead. Selectability: 744. For use with: HP DesignJet Z2600/Z5600. Colour: Photo Black/Cyan. Product Details. HP 744 Printhead Magenta and Yellow F9J87A. Original HP Printhead. Selectability: 744. For use with: HP DesignJet Z2600/Z5600. Para el uso con: impresora de recibos POS Wincor Nixdorf TP13. Mantenga las etiquetas completas y los artículos limpios sin sabor, o no aceptaremos la devolución. ORIGINAL HP OFFICEJET 88 MAGENTA AND 88 CYAN C9382A PRINTHEAD PRINT HEAD. HP C9382A MAGENTA & CYAN x 1. FOR USE IN HP OFFICEJET PRO DATE: JUN 2013. NEW IN OPENED BOX. HP Designjet T610, T620, T770, T1100, T1200, HP Designjet T1200 HD, HP Designjet T2300 eMFP, HP Designjet T790, HP Designjet T1300. Matte black, Yellow. Storage relative humidity (H-H). 1219 x 1016 x 1325 mm. Printheads like this HP 771 unit regulate the flow of ink from your cartridge and are responsible for the print quality you have come to enjoy from your printer. Dealing exclusively with both matte black and chromatic red coloured ink, the CE017A has to work with a level of precision that you can only trust Hewlett Packard to deliver.Many, many prints can be produced with the CE017A before is needs changing and its replacement in compatible printers like the HP Designjet Z6200 42-in will certainly be a rarity. Thankfully Hewlett Packard have made installing the HP 771 as simple and pain-free as possible. Click here for more details. New HP PRINT HEAD FOR HP OFFICEJET 6000 6500 6500A 7000 7500A CN643A CD868-30001. OfficeJet 6000, OfficeJet 6500, OfficeJet 6500A, OfficeJet 6500A OfficeJet 7000, OfficeJet 7500 A. Your visual Photo is good for us to take action for you. Present your professional best while keeping your productivity high. Magenta and cyan. Color(s) of printing suppliesMagenta and cyan. Print Resolution. Print head nozzles2112. Printing Material Shelf Life12 months. Approximate RRP £200, grab yourself a bargain. Present your professional best while keeping your productivity high. Matte black and yellow. Color(s) of printing suppliesMatte black and yellow. Print head nozzles2112. Box contents. What's in the boxPrinthead. Photo black and light grey printhead. For use in HP DesignJet Z6810 and Z6610 60" series large format printers. Provides clear text and vivid images. Product Details. Page yield 700. Compatible Printers: HP OfficeJet 4500 Series, HP OfficeJet J 4600 Series, HP OfficeJet J 4535, HP OfficeJet J 4545, HP OfficeJet 4500 Wireless, HP OfficeJet J 4580, HP OfficeJet J 4660, HP OfficeJet 4500, HP OfficeJet J 4524, HP OfficeJet J 4550, HP OfficeJet J 4624, HP OfficeJet J 4585, HP OfficeJet J 4680 C, HP OfficeJet J 4680, HP OfficeJet J 4540, HP OfficeJet J 4500 Series SPECIFICATIONS Technical details. Black ink page yield. Print technology. Printing colours. Thermal inkjet. Replaces N9J71AE. HP 62 Black And Colour. Also known as N9J71AE, HP 62, 62, C2P04AE, C2P06AE, J3M80AE. Product Family: HP 62. Manufacturer: HP. HP Envy 5540 e-All-in-One. HP Envy 5541. HP Envy 5542. The Hewlett Packard Original HPC9382A / HP88 Magenta and Cyan Printhead is a Brand new product designed and manufactured by Hewlett Packard to give professional, crisp results. As the HPC9382 / HP88 Magenta and Cyan Printhead is a HP Genuine Product you can enjoy Hassle Free printing from the first page to the last, as it will give 100% guaranteed compatibility with your Hewlett Packard Printer. This Hewlett Packard Original HPC9382A / HP88 Magenta and Cyan Printhead has a Massive duty cycle of around 41,500 pages (based on a 5% coverage) and is designed to be changed when prompted to maintain HP`s high quality results. The HP 88 Original Magenta and Cyan Printhead will be compatible with a... Click here for more details. C9384A Print Head Black Yellow. Print Head Black Yellow. HP 744 Printhead Matte Black and Red F9J88A. Original HP Printhead. Selectability: 744. Colour: Matte Black/Red. For use with: HP DesignJet Z2600/Z5600. During that process you will be issued with an RMA number. C4810A Printhead Black 28 ml. Printhead Black 28 ml. Pages 16.000 ( no. 11 ). Genuine HP C8749A Cabezal de impresión vinculación Agent 2014 CM8050 CM8060 20% de IVA Inc. Approximate RRP £120 grab a bargain. HP's new printhead design makes HP's Scalable Printing Technology the preferred choice for the office. To keep pace with you, HP's new printhead is designed together with new HP 88 inks to produce high-quality results, even at fast print speeds. Expiry from 2010 as like my other HP print heads for sale but paper on box is torn from sticky label. C4811A Printhead Cyan 28 ml. Printhead Cyan 28 ml. Pages 24.000 ( no. 11 ). 920 printhead For HP 6000 6500 6500A 6500AE 7000 7500A B109 B209A printer. 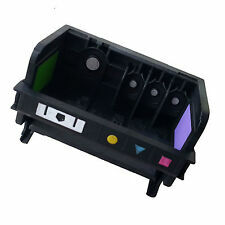 Printer: Suitable for HP 6000 6500 6500A 6500AE 7000 7500A B109 B209A. C4813AE Printhead Yellow 28 ml. Printhead Yellow 28 ml. Pages 24.000 ( no. 11 ). The printhead contains smart technology that optimizes print quality and monitors printhead health. Separate black and colour. This system allows for you to get the longest dated and genuine products available. REF C178 / C179 / C218 / C298. 6 piece Nozzle connection C6074-60415 Q1273-60050 Q1253-60041 easy Fix ink tubes z4000 z4500 z6100 z6200 T7100 L25500 L26500. Condition: New. The printhead contains smart technology that optimizes print quality and monitors printhead health. This system allows for you to get the longest dated and genuine products available.